Kids with autism typically have difficulty in one or more of these three areas: communication, response to sensory information, and social interaction. I don't know about you, but of all these areas, I find social skills to be the most worrisome. This is mostly because teaching these skills is so daunting to me. Helping a child communicate better? Now, that I can handle. And dealing with sensory issues? Yep, I'm pretty comfortable with that as well. Though neither of those areas are a piece of cake, they do seem a bit more clear cut than social development. But teaching my kid how to make friends, how to ask to join a game, how to use a tone of voice appropriate to a particular situation? So difficult. There are so many nuances to social interaction that seem intuitive to me. And that makes it difficult to teach. Worse yet is trying to teach him how to be patient and control his anger. When our developmental pediatrician recommend ed a social skills group, I agreed immediately. Of course, I would drive over 60 miles round trip once a week. If someone could help my kid learn to make friends, I would walk if I had to! Problem is, the social skills group only went so far. He learned about facial expressions and emotions, but still didn't seem to have any practical skills that would come in handy on the play ground. So, I did research. I read a few social skills books and websites, desperately looking for a program that could really help Danny. What I discovered, though, was that many social skills programs are based on role playing; there does n't seem to be much opportunity for actual practice of the skills, which is exactly what my son needs. He has no problem answering the questions right, but extrapolating that information onto a social interaction has proven enormously difficult for him. On top of that, Danny wasn't all that interested in the social skills group. The only reason he looked forward to it every week was because the Center had Legos, which he could play with when the group was done. For months, I worried and agonized over how to teach my son, Danny, social skills. One day, as I wrote a post about my Danny's obsession with Legos, the thought occurred to me that if I could combine legos with social skills, we would have the winning ticket. So, when Tiffani Lawton from Our Journey Thru Autism sent me the link to the Center for Neurological and Neurodevelopmental Health's website, I couldn't believe my luck. They had developed a Lego Social Skills protocol based on research. Finally, a program that was inherently motivating. I knew my son would beg to participate, solely because it would have Legos. The CNNH calls this program "social development therapy" which I initially thought peculiar. Social therapy? Why therapy? Isn't it just a bunch of kids playing? Now that I have read the manual, I know that it is so much more than that. This is a serious, very structured and amazingly well thought out set-up. Every aspect of the program is designed to teach kids not only how to work cooperatively, but how to resolve conflict, compromise with others and become good role models. Let me give you an example. The kids are put into groups of 2 and 3. Every session, the groups each have the opportunity to choose which set they want to work on. So, every single session, the kids have to discuss and negotiate. If they take too long arguing about what to build, they lose precious Lego time. So, without bribery or threats, the kids learn not to argue, but how to compromise. The club is very child-driven. The kids are trained to confront others who are disobeying rules. They are expected to work together on sets and on freestyle projects. They are given chances to be leaders of the group. They even decide when a child needs a time out because of behavior. Of course, all this happens with adult supervision, so the kids are learning these skills in a safe environment with guidance. The more I read about this program, the more excited I get. This is not the kids role playing what to do when someone steals their toys. No, this is real life practice. They don't sit around talking about how it might make them feel if they were left out. Instead, they are encouraged to broach these subjects with each other as they play. So, not only are they learning how to work with others, they learn to be their own advocates, to make their needs known. We officially start our group in about 2 weeks, and I am frantically working to get everything done in time. But all the hard work is worth it. My son will finally have the opportunity to learn social skills in a way that he loves. And I cannot tell you how amazing it makes me feel that I get to be the one to help him. My son, Danny, was diagnosed with Sensory Processing Disorder over 5 years ago by a very competent therapist. I love Danny's OT, Linda; she is practically psychic, a kind of SPD whisperer, if you will. The only drawback to taking Danny to Linda for therapy is that she is located about 45 minutes south of Chicago, which is 2.5 hours north of where we live. Because of the distance, after Danny was diagnosed, I searched high and low for a therapist who was closer. After trying just about every pediatric OT within a 70 mile radius (which really isn't that many; apparently southern Illinois has a serious shortage of OTs) we have decided to stick with Linda. She is the only therapist we have worked with who really understands SPD. I have been amazed at how many OTs and other professionals out there who really don't understand the nature of SPD and how to treat it. Many of the supposed experts seem to think that sensory activties (or a sensory diet) is the same thing as Sensory Integration therapy. If you have a kid with SPD, I am sure you know that a sensory diet refers to activities you can do at home to engage a kid's senses. Some popular activities include playing with clay, dried beans, playing in a ball pit, working with fine motor activities like Legos, lots of jumping and other deep pressure activities, among many, many other things. These activities are most efficacious when done consistently every day. They are vital in keeping a kid regulated and able to focus and deal with life and sensory stimulation, in general. But they do not constitute SI therapy. at we had been seeing her for months, it had never advanced beyond them. I happened to run into Dr. Miller during a break, and though I hated to bother her, I asked her about my concerns. I described the activities the therapist was doing with Danny and asked if this were really proper SI therapy. I will never forget her answer. As she looked me straight in the eyes, Dr. Miller said, "You already know the answer to that." She said that my instincts were right on, and she encouraged me to find a therapist who knew the difference between sensory diet activities and SI therapy. And then, once the conference reconvened, Dr. Miller took a minute to explain to all the Occupational Therapists in the audience the difference between SI therapy and sensory diet. She said, "If you are just swinging kids in swings, you arenot doing SI therapy." -regulation, among many other things. Linda NEVER has Danny just sit in a swing. 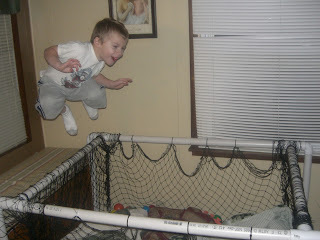 When he is swinging, he is doing all kinds of activities, like throwing a ball through a hoop or aiming at a target, etc. Also, she has him change positions. Sometimes he swings sitting up, other times, he is on his stomach and still others, he is on his back. This change of position is really important because exercising in each different position affects the vestibular system in a different way. o on your stomach. It's pretty trippy! Both sensory diet and SI therapy are vital for kids with SPD. Neither can replace the other. So, if you have an OT who is merely doing sensory diet activities with your child, I suggest you question her. Do some research and ask your OT why she is doing a particular activity and how it will help your child. Make sure that the therapy goes beyond just simple sensory diet activities. After all, you can and should do sensory diet activities at home. The OT should be concentrating on actual therapy. That's why she charges over $100 an hour! 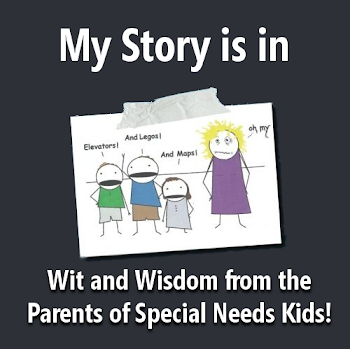 Check out S-O-S Research blog for more posts about therapy and special needs. Winner of a Creative Child Magazine's 2011 Top Choice of the Year Award, EyeGames: Easy and Fun Visual Exercises by Lois Hickman and Rebecca E. Hutchins is a treasure trove of information about visual problems that often face kids. You might wonder what the point of this book is. After all, if you suspect your child has a vision problem, you would just take him to the eye doctor. But here's the thing: being able to read a vision chart is just one aspect of your child's vision. He could have perfect 20/20 vision and yet have other challenges with visual perception. Challenges that greatly affects your child's ability to read and learn. Apparently, problems with visual perception are not uncommon among individuals with autism. They can include issues in any one of the following areas: following, fixation, focus, fusion, flexibility, field, and fatigue. I have recently suspected that Danny has problems keeping his eyes on the book (fixation) and moving them along the words on the page (following). After seeing his Occupational Therapist, I discovered he might have difficulties with other areas, as well. What I like most about this book is all the explanation and background of vision problems. These authors explain the issues in an easy to read way. They also explain the roles of Behavioral Optometrists and Occupational Therapists in helping kids with vision problems. The rest of the book is dedicated to the Eye Games or activities to help a child improve his visual processing. The games are clearly marked as to whether they are meant for children or adults. Also, the authors indicate what setting the games are designed for. As I said, this book is a treasure trove of information. It is replete with great ideas for activities, information on how computers affect vision, how light can affect sleep, and how visualization is the "crown jewel of vision." And these activities can benefit anyone, even if you don't suspect a vision issue. I learned a tremendous amount reading this book and am glad I own it, as it is a valuable resource. This book will assist us as we try to get to the bottom of Danny's vision issues. If you're looking for a book about autism that is infinitely validating, honest and hopeful, look no further. 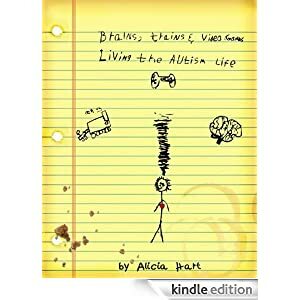 Brains, Trains, and Video Games by Alicia Hart has all that and more. This book chronicles the sometimes heartbreaking, often triumphant journey of one family with autism. Alicia Hart, the mother of three, details the diagnosis, treatment and life of her son Ewan. Now, I need to tell you that I happen to know this author. Alicia started a group in my town for kids with autism. Adventure Club was an answer to my prayers. It was a club which taught kids science while also teaching them social skills. More than that, it was a club whose sole goal was to provide our kids with fun. 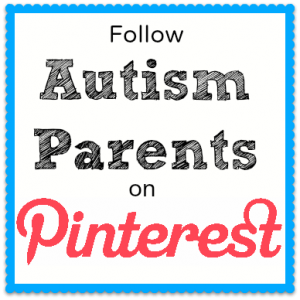 Adventure Club is also where I met some autism moms in my area. And I got to know Alicia, this amazing mom and advocate for special needs kids. On top of motherhood, Alicia has also worked with kids with autism professionally. I know I shouldn't get personal with book reviews. I should be totally objective and all that, but here's the thing: Alicia gets kids with autism. She understands them more than any professional I have ever met. She knows how far to push them and when to back off. Best of all, she accepts them for who they are. She loves them, quirks and all. Immediately, I felt that she cared for Danny. A lot! They bonded over their mutual love for pajamas and from then on, I couldn't keep Danny away from Adventure Club. Alicia is also who inspired me to start the LEGO Club. The reason I write all this is to show that Alicia knows autism. She knows what it's like to struggle to get services for her child. She understands the grief that accompanies hearing your child be diagnosed with autism. She has felt how utterly overwhelming it when a child needs several different therapies and services. She knows the guilt a mother feels when her neurotypical child feels a bit neglected. And best of all, Alicia is not afraid to share all these feelings in this very open-hearted, sincere and authentic book. Reading Brains, Trains and Video Games feels like you're sitting down to coffee with the most knowledgeable autism advocate, wrapped up in a mom who is sometimes self-deprecating and who never takes herself too seriously. Throw in a person who is genuine and has a passion for helping our kids and you have Alicia. And this is why you should read her book. 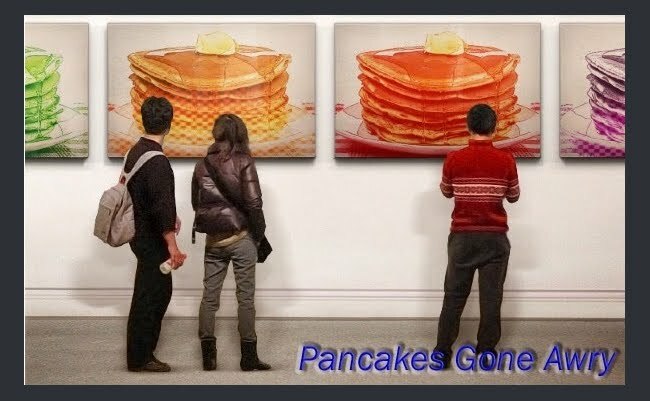 It's the next best thing to sitting down face to face over Diet Coke and pie! So, do yourself a favor and go order Brains, Trains, and Video Games. You'll thank me. I know you will!